Kaplan's selection of bilingual carpets acts as secondary reinforcement for students who are learning foreign languages or immersion programs. Rugs cover a range of topics, including cultural diversity, calendar, alphabet, numbers, and signs. 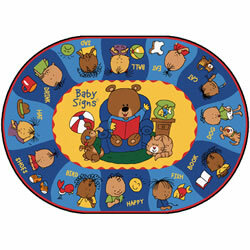 These adorable characters from Baby Signs® will help teach kids of any age how to say everyday words in sign language. The colorful characters and design will be a bright addition to any room. Proudly made in the U.S.A., this 6'9" x 9'5" oval rug is durably designed to provide a life time of learning and childhood memories. Celebrate diversity! The Spanish alphabet surrounds 18 shapes, colors, and words in English and Spanish. Up to 30 children can sit or stand on the alphabet letters. The dense weave backing system features a revolutionary antibacterial treatment for improved hygiene and stability. The carpet also has Carpet Guard stain protection and a 15-year pile wear warranty. Bilingual Carpet Squares (item #46873 and #46874) are sold separately. 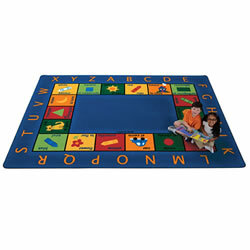 Bilingual Icon Carpet Squares can be used alone or combined with the Bilingual Carpet (sold separately) for matching fun. 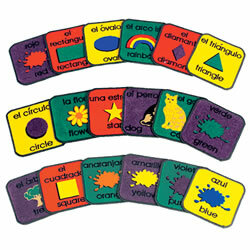 The vividly colored pictures provide the perfect way for children to learn the Spanish and English word for the image. 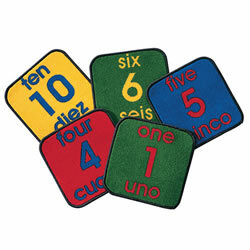 Proudly made in the U.S.A., these squares are durably designed to provide a life time of learning and fun! Set includes eighteen squares. 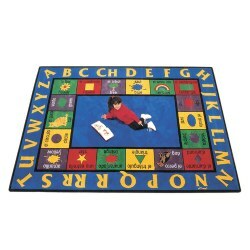 The Bilingual Number Carpet Squares can be used alone or combined with the Bilingual Carpet (sold separately). 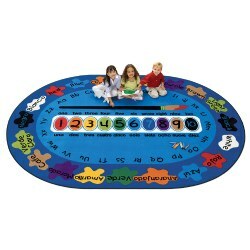 The vividly colored numbers provide the perfect way for children to learn the Spanish and English word for the numeric number. Proudly made in the U.S.A., these squares are durably designed to provide a life time of learning and fun! Set includes the numbers 1-10.